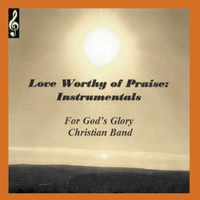 Easy listening and Inspiring instrumental remixes of the songs on For God's Glory Christian Band's "Love Worthy of Praise" album. This album consists of Instrumental selections which cross a variety of genres. Some genres include: Easy Listening, Classic Rock, and Caribbean. The songs are instrumental remixes from the band's "Love Worthy of Praise" CD.